Electric light bulbs like this are very wasteful when used as a light source. About 95% of the electrical energy is changed into heat - not the required form - light! In modern houses they have been replaced by energy saving bulbs. Tungsten Filament This is the main working part of a lightbulb. It is a heating element that gets so hot that it emits light. It is made of tungsten as it does not reach its melting point and evaporates very little at the typical filament operating temperatures of 2,000oC . Vacuum or Gas Fill This is to prevent oxidation of the tungsten. If an inert gas fill is used, it is usually a mixture of argon and nitrogen. Argon is an inexpensive inert gas that conducts heat less than nitrogen does. Destructive electric arcs form easily in pure argon, so nitrogen is added to keep arcs from forming easily. A gas fill is better than a vacuum as it slows down evaporation of the filament. Gas atoms can "bounce" atoms of evaporated tungsten back onto the filament. So with a gas fill, the filament lasts longer and can be operated at a higher temperature. This allows it to give off more light. A gas fill has the disadvantage of conducting heat from the filament but the advantages of a gas fill usually outweigh the disadvantages for power ratings of above 40W.A few lightbulbs have premium gas fills using krypton or xenon, which conduct heat less than argon does and reduce filament evaporation more than argon does, but these are more expensive. Glass Bulb This is the main structural part and keeps the gas or vacuum in and the air out. Filament Support(s) Many but not all incandescent lamps have these. The filament supports keep the filament from bending out of shape from its own weight or from shock and vibration. Filament supports are usually made of molybdenum since this metal is easily worked into glass and it has a very high melting point. Base This is where electrical contact is made. Fuse Wire Most bulbs have this as a built-in fuse in case an arc forms. If an arc forms and there is no fuse wire inside the bulb, the arc can draw enough current to trip a breaker or blow a fuse in the fusebox or damage a light dimmer. The presence of this fusewire allows any overload to be 'dealt with' within the bulb itself. Lead-In Wires These connect the filament to the base. The light bulb contains a coiled filament of metal with a high melting point. The coil is sealed in a glass tube that is filled with a mixture of inert gases such as argon and nitrogen instead of air. When metals are heated in air they are oxidised (react with the oxygen in the air) and produce oxides of the metal, which are often in powder form, and not conductors of electricity. When the lamp is turned on, a current flows through the filament and it glows. It gets very hot very quickly and reaches a very high temperature. The inert gases are present to prevent combustion occurring. This would oxidise the metal filament, turn it into the powdery non-conducting oxide and make it unable to conduct electricity any more. A light bulb circuit needs of source of electric energy that provides a potential difference (voltage) across the light bulb. It doesn't matter whether this is a DC supply (direct current) like a battery or an AC supply (alternating current) like the mains. Both will make the lamp filament wire get hot and glow. You have to be careful about the size of the potential difference the power supply provides. If it is too small the bulb will hardly glow at all. If it is too large the bulb filament will get too hot and melt (the bulb will blow!). The bulb does not 'blow up' but the rapid air expansion due to the heat energy produced when the high current passes through the wire sometimes is heard as a 'BANG' and we say it 'blows'. 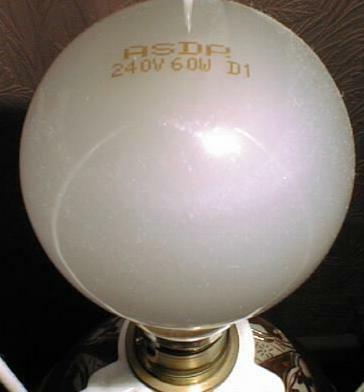 If you look carefully at a light bulb you will find the working voltage stamped into the metal at the base of the bulb or etched into the glass bulb itself. The power of the bulb is usually also written there. The light bulb filament is a coil of wire which acts as a resistor. It is coiled so that the wire can get very hot and glow (produce light). Heat is produced when a current passes through a wire. It is radiated to the surroundings and absorbed by air molecules that are near to the wire. These carry away the heat in convection currents Most of the time we do not want electrical wires to get hot. When they are hot theirresistance increases and this can affect the way a piece of electrical equipment works. Therefore we design electrical equipment casing with cooling fins and vents to allow the heat energy to quickly dissipate (get shared out) to the surroundings. A light bulb filament needs to be hot, in fact we need it so hot that it glows! Therefore we do the opposite. We coil the wire round and round making it difficult for the pockets of hot air to escape and making the resistance of the filament even greater. Another reason why the filament is curled into a coil is so that a great length of glowing wire can be concentrated in a small space, making a more concentrated light source. 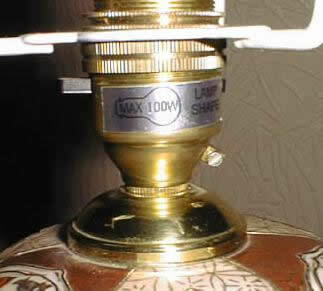 Lamp bases have a maximum power rating indicated on them. If you fit a bulb with a bigger power rating than this the wiring within the lamp base will get too hot and it may be a fire risk. 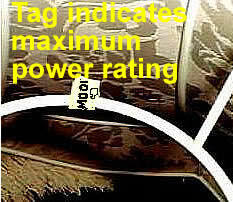 Lamp shades have a maximum power rating indicated on them when you buy them. This is usually a little paper tag. If you fit a bulb with a bigger power rating than this too much heat may be produced for the shade, it may get hot and catch fire. You should always look carefully at instructions with a new appliance.